Can you feel the breeze? There's a whole lot of spinning going on around here. The other day we welcomed shareholders Amy and Tasha to the Little Red Barn for their complimentary lessons. She was spinning a nice, even worsted weight yarn before you could say Bob's your uncle. Tasha also had it goin' on very quickly. I did my best to get them to mess up a lot so that I could help them overcome problems, but they were way ahead of me in finding solutions. They made my job so easy! They got all warmed up so that they could take their brand new yarn to their Knit Night later that evening. We had such a blast - these ladies are a riot. (Don't ya love Tasha's llama shirt?) A little more time in the chairs, girls, and you'll be ready for Big Girl Wheels. Come back soon! 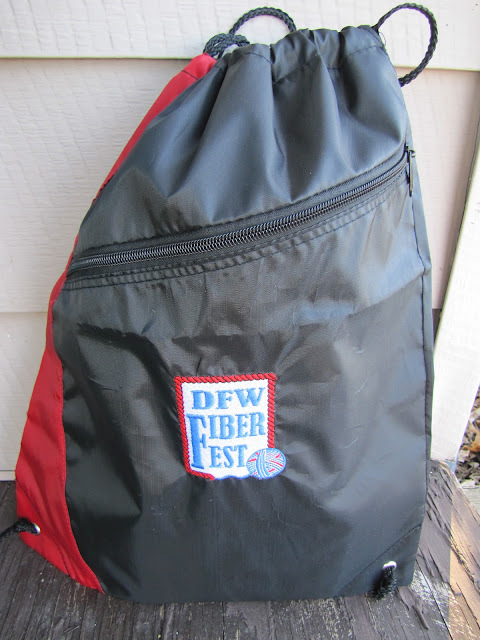 Next, it was off to my other friend, Amy's house. 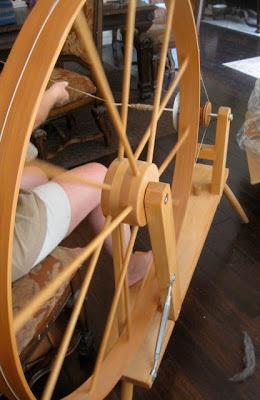 She has bought a gorgeous Rio Grande wheel from our friend Kay, and wanted to learn to use it. 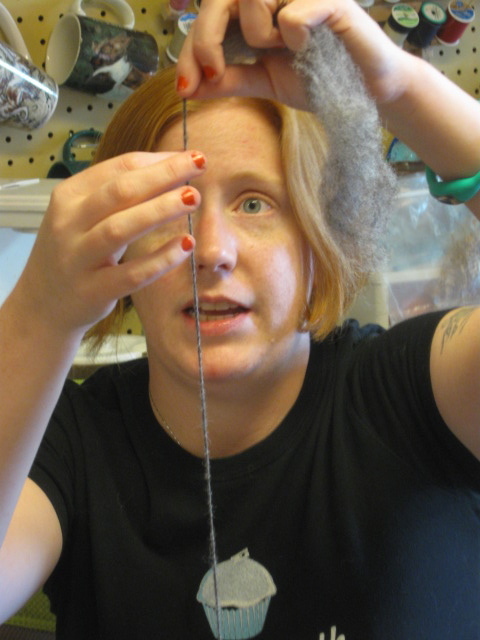 Now, Amy has raised alpacas for years and has spun on commercial equipment, but this was her first foray into the world of hand spinning. 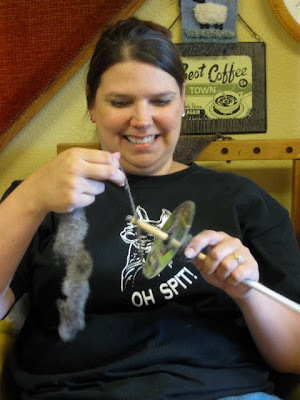 I had never used a quill wheel, so I had to do a little homework myself before I could help her. This "great wheel" is so beautiful to look at, and to watch in motion. 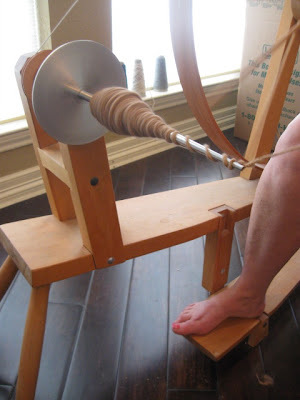 The spinning operation is sort of a cross between a drop spindle and a bobbin wheel. 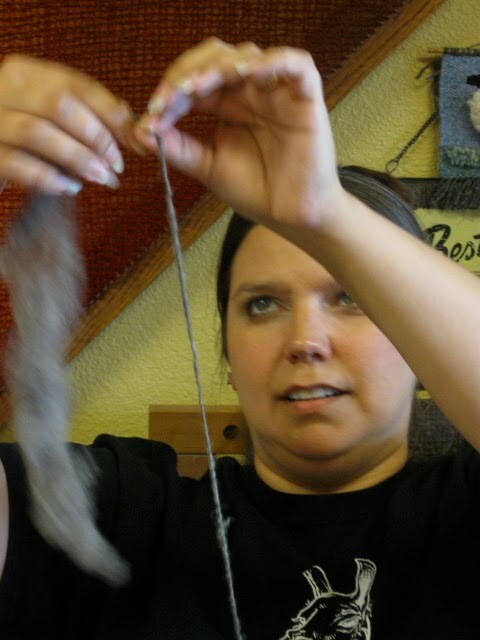 A length of yarn is spun on the quill, then wound around the quill to store it, and then the process repeats. It takes a little practice to keep the yarn coming off the tip of the quill, but once you get in a rhythm, everything makes sense. We're still working on winding the yarn neatly on the quill, but I think her first plied yarn is very, very nice. Beautiful job, Amy! Time to tackle all that gorgeous alpaca roving that's been piling up around you! If you're keeping track, that's Spinners #83, 84, and 85. I hate to reduce these precious ladies to numbers, but I do fill up with joy at the thought of our spinning sisterhood growing... Yarn on! OMG, I'm soooo jealous! 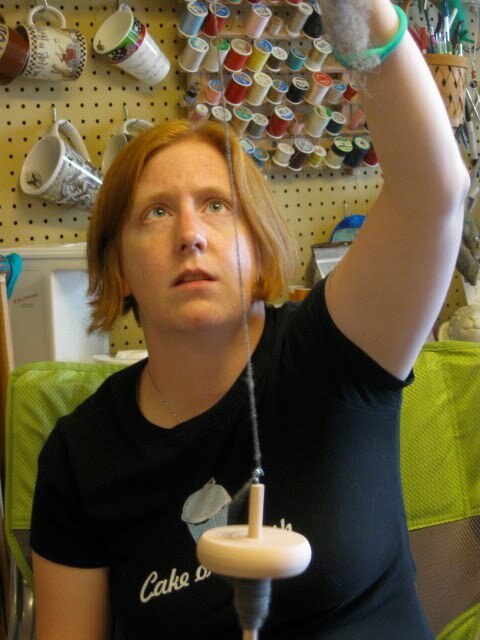 I'm excited you've got so many ladies interested in spinning, too. I just love hearing about all of the people who are taking up hand embroidery, knitting & crochet, spinning and all the in between yarn crafts. We'll be back. And I'm giving the wheel a spin next time! Thank you so much - it was fun. So glad the grand lady Rio Grande is working out for Amy. It's beauty.